MOORESVILLE, N.C. (Aug. 29, 2017) – Returning to Road America for the first time since 2013, Cunningham Motorsports drivers Shane Lee, Dalton Sargeant and Austin Cindric turned heads in the Road America 100 this past weekend. From leading laps to making last chance pit stops, all three Cunningham drivers had a storyline of their own in the one road course race of the 2017 ARCA Racing Series presented by Menards season. Starting on General Tire rain tires, Lee made a green flag pit stop on lap eight to change all four tires to slicks and fill up on Sunoco fuel. On lap nine Lee reported dragging in the left front of the car. He came down pit road under a full-course caution (lap 13) to make adjustments and assess the issue and restarted 14th (lap 15). With a restart on lap 23, Lee took the green flag in 10th and worked his way into the top-five with just two laps left to finish fourth in his first road course start. By lap three Sargeant had the lead until he came down pit road under green (lap nine) to exchange his General Tire rain tires for slicks, fill up on Sunoco fuel and make slight adjustments. Moving back into the fourth position, Sargeant held that until deciding to return to pit road under a full-course caution on lap 21 for fresh General Tires and fuel. Restarting in the 14th position, Sargeant made his way to first and finished in fourth-place after falling behind in a few turns. That fourth-place finish would be moved to eighth after Sargeant was penalized four spots for jumping the last restart. 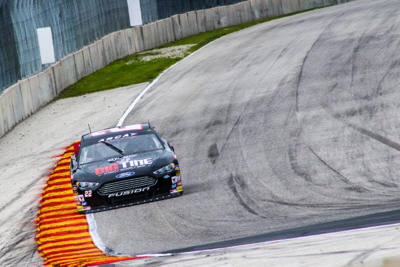 Cindric started the weekend off strong by recording the fastest laps in two practice sessions. With General Tire Pole Qualifying cancelled from rain, the No. 99 Menards team started in the first position based off of those times. After losing the lead to Sargeant on lap three, Cindric came down pit road on lap five to change all four General Tires from rain tires to slicks. Cindric regained the lead by lap nine once all green flag pit stops were complete. Cindric held the lead until the last lap and was poised for the win until another car made contact with the No. 99 in turn one, spinning Cindric around and out of contention for the win.